Chat about the book on FACEBOOK. * Amazon generally lists the book as ‘out of stock’ but it orders the book on demand, so if you prefer to use Amazon please do. It just takes a bit longer. 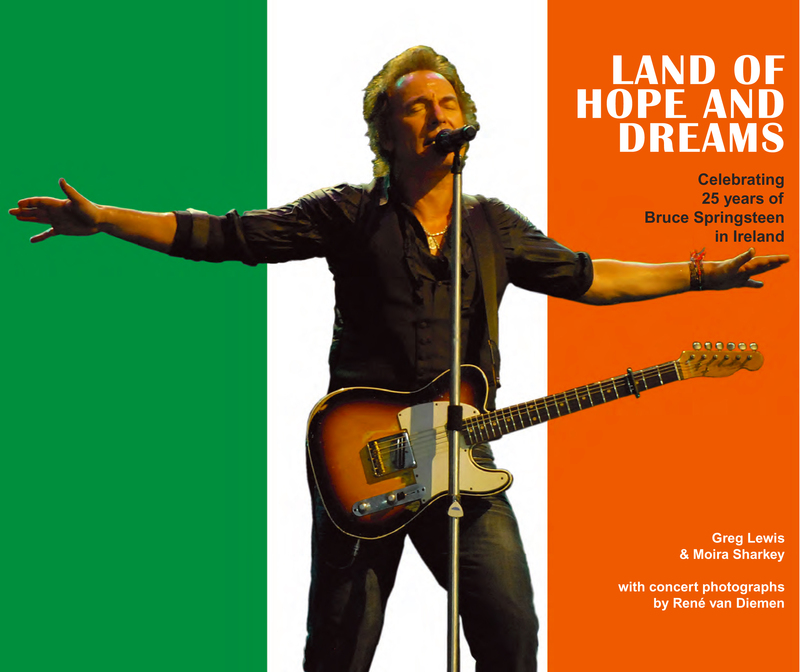 Greg-you are such a great writer- love “Land of Hope and dreams” from cover to cover.I thought it was so unique to cover every irish gig and brought back many memories for me. I wonder could you help- I just heard a heart-breaking interview on Irish Radio on the “Ray Darcy Show” on Today FM with a Michael Bolger, one of the brothers of three Bolger Brothers from the coast of Co Wexford who died in a freak boating tragedy last week. If you heard what I heard it would break your heart. At the end they played the three brothers favourite song “The River” by The Boss and I’ve never had goose-bumps like when I heard the words of the song in the context of that interview. The interview will soon be on a download if you want to hear it. Is there any way Greg somehow, that you could make his management company aware of this tragedy- he’s playing Kilkenny which is right beside Wexford in a few weeks and it would be a lovely tribute to the families left behind if he could acknowledge this. The wives of the men were also completely dependent on their husbands for their livelihoods so maybe “The River” could get back to the top of the charts in their honour or something. I think they might be doing organising a benefit gig of some sort too. You can remove this from the blog no problem. I just feel a bit helpless/angry about things after hearing their story. I’m sorry if this seems brazen and appreciate your time for reading and won’t hassle you on this again I promise. I just don’t know how to contact Bruce’s management. Thank you Greg and continued success and good health to you and Moira. The Bolgers were from Co Waterford sorry Greg but went fishing off the Wexford coast . So sorry I didn’t see this until now. I am so glad the recording of The River was made and is doing so well.